BANGKOK, Thailand - Taking a break from deficit negotiations for a whirlwind tour of southeast Asia, President Obama joked this afternoon as he toured a sacred Buddhist temple that he could use some prayer to help reach a budget deal. "We're working on this budget, we're going to need a lot of prayer for that," the president told a monk at the Wat Pho Royal Monastery. The president later explained the quip at a joint press conference with Prime Minister Yingluck Shinawatra. "I always believe in prayer," he said. "If a Buddhist monk is wishing me well, I'm going to take whatever good vibes he can give me to try to deal with some challenges back home." 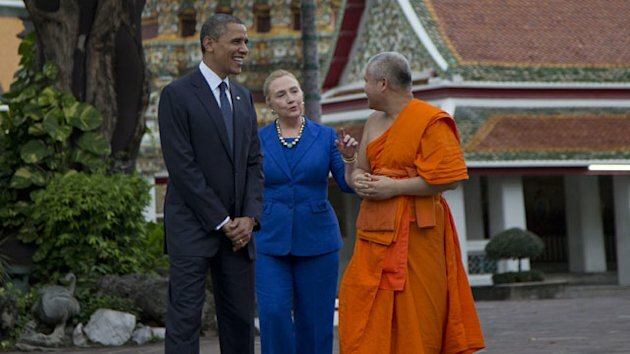 Shortly after arriving in Bangkok, Obama, accompanied by Secretary of State Hillary Clinton, toured the Viharn of the Reclining Buddha, one of the most famous sites in Thailand, and the Eastern Viharn Phra.